We had a chair like this. It was like a chair but with 2 steps that folded in under the chair when not in use. 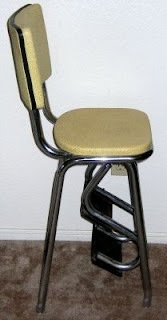 We just called it a stool, I think, and was used often by us kids to get things on high shelves. Posted by Karen at 8:47 p.m.
During big dinners at my Bubby's house this was the most coveted seat in the house. 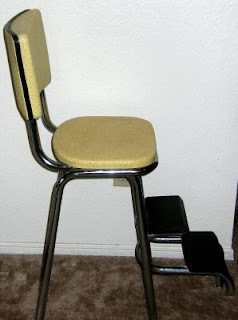 As it turns out my aunt was a child in an adult body and she would routinely challenge me to jaxs or jump rope for the right to sit on the chair. Those days are gone and so is my grandmother but as I remember her wisdom I decided to blog on the wit and wisdom of women. I have created a new blog for women that want to share wit and wisdom as they manage day-to-day life. The blog features quotes of famous women and applies them to everyday situations. Please share this blog with the women in your life. We would love to hear from you, and share your favorite piece of wisdom.